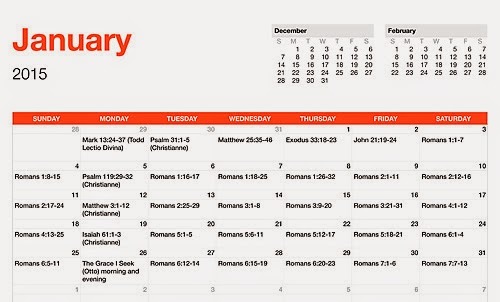 So I'm just making this up as I go along, and don't know if anyone out there is interested, but I decided for this month, after catching up on the handful of days I missed in December, to start reading through Romans. When I was joining the Episcopal church we did Lectio Divina in my catechsis class for several Gospel passages. I LOVED it, yet somehow I haven't had the discipline to do it on my own. Maybe I should do a calendar like this. Thanks for posting!